Welcome back to the series of posts where I go against better judgement and try to catalog my vast CD Collection. You know...for research. This time I actually posed a poll to Twitter and let them decide. Due to the unique nature of the lead CD in this post, I was given a choice of two genres. Instead of letting me end Metal Hero once and for all (seriously...I've reviewed every music collection and every song--the only thing left is the 8cm singles) Super Sentai was chosen with an 81% win. Now, since there are quite a few Sentai 8cm CDs left for me to review, I've decided to break them down into four posts. Today I will be looking at Liveman to Ohranger. In January I looked at the fourteen (!) Carranger singles. The final two posts will cover Megaranger-Gingaman (10 CDs) and Gogo Five-Timeranger (10 CDs). This will be an interesting post to those interested in 8cm CD Singles. It took a few years for the concept to fully take shape, and you'll see the transformation take place all in one post. As always, I do not provide downloads of music featured in these posts on my website. These posts are for reference only since there is a severe lack of information on Tokusatsu CDs on the internet. 1988 was a pretty good year for Japanese music. A lot of the junk that polluted the charts in the years prior was on it's way out and the artists with true staying power had finally hit their stride before the slate was basically wiped clean in the early 90s. The most enduring relic of 80s Japanese music was the rise of the Compact Disc. The standard 12cm disc had been around for several years by this point, but the 8cm CD Single format was introduced in mid-1988. If I wrote this post six weeks ago, this CD wouldn't have been included. Simply put, I didn't know it existed until a month ago. I spotted it for sale at one of my usual CD haunts and immediately grabbed it. What an interesting find! It instantly became one of my favorite CDs in my Tokusatsu CD Single Collection. I use the term "Single" loosely, however. If you look closely at the bottom corner it says "CD Mini Album". I suppose they weren't quite sure what they wanted to do with this format, so they did a kinda retro-release of the current Sentai and Metal Hero shows--Liveman and Jiraiya. This mini album features the two theme songs from Liveman by Daisuke Shima and the themes from Jiraiya by Akira Kushida. Both Liveman theme songs are fantastic. There is a certain bleakness to the Liveman theme that fits all too well with the premise of the show, yet it is still suitable as an action tune. If anything, though, it isn't too different from the Maskman opening theme song. The ending song, Ashita ni ikiru ze, has always been one of my favorite ending songs. It kinda marked the long overdue end to disco in Tokusatsu music, but it was a great way to go out. As for Jiraiya... Well, I'll talk about that when I get around to writing my post on 8cm Metal Hero CDs. Hehe. In the early days of this site I talked about how great of an opening theme song Turboranger has. This, along with pretty much all of the other songs on the song collection, has an incredibly rich sound that makes it stick out among other songs of the era. Kenta Satou sings the opening as well as the ending theme song Zig Zag Seishun Road. I would say that the ending song is better than average, but certainly not among the higher end of my favorite Sentai ending songs. This CD, which I believed until very recently to be the oldest Super Sentai 8cm Single, is bare on content, but huge in artwork. Just look at that front cover. There was also a 45 single released for Turboranger which you would think has the better artwork, but does not. As this was a very early 8cm release, it does feature the folding tanzaku style packaging. Basically the bottom half of the tray snaps off, the outer sleeve is folded over, and the packaging is now half the size! The Liveman/Jiraiya CD is also like this. As it was incredibly unpopular to ruin the CD case in the name of slight convenience, most record labels soon caught on and abandoned the creases to fold the sleeve by 1992. No Karaoke versions of the songs on this disc. It's just the vocal opening and ending theme songs this time. Now we arrive at Fiveman. Hmmm... The less said about either Fiveman theme song the better. I mean they're OK, but they're the type of song that gets old very quickly. Maybe not as bad as some other theme songs you'll be reading about here today, but they're just not very impressive. The opening theme song is a little bit too repetitive for my tastes. The ending theme, Fiveman, Ai no theme is also incredibly unremarkable and eerily similar at times to the excellent theme song from Tom Sawyer no Bouken (I really do dig that song.......shut up...). Both songs sound incredibly flat when you stand them up to the Turboranger themes. I can't really say I dig the artwork so much this time around. 1990 was the year that Nippon Columbia finally ditched vinyl, which doesn't leave a 45 alternative to this one. The lyrics are printed on the inner side of the tanzaku this time, like the Turboranger single. This one still features the option to fold the sleeve over. There is still a disappointing lack of Karaoke tracks. Just the vocal versions of the theme songs here. Here is the section where just about everyone will question my taste AND credibility. I really don't like the Jetman theme song. It's repetitive, tacky, and waaay overplayed. The guitars are cool, but the whole affair is just overly peppy considering the show was the first to lay on some heavy emotion that was previously reserved for spandex-free dramas. It's just...not a very good fit. People love it, though. In an interview in Figure King issue 44, Producer Takeyuki Suzuki seems fairly convinced that the overly-repetitive nature of the theme song to Mighty Morphin' Power Rangers was inspired by the Jetman opening theme song. I can totally see where he is coming from since there are some similar elements and coincidental timing between the two songs. He must have had some further reasoning behind this claim, but this is all I could get from the interview. However, composer Ron Wasserman has said that the MMPR theme song was created in a very short amount of time with very little reference. My take-away is this... Maybe a third party at Saban had a hand in the situation to link the two stories. It's likely pure coincidence, though. It's very likely, in fact, that Suzuki just labeled both theme songs as something that simpletons would enjoy to sloppily clap along to...in the most polite way, of course. This is the first CD to not have the folding style of tanzaku, yet it is the last to not have Karaoke. That's right...just the two vocal theme songs on this one. The Zyuranger opening song is a little journey into strangeness. What's with that intro? I believe arranger Kenji Yamamoto (of the prestigious Plagiarism Hall-Of-Fame) had just seen the film Total Recall and wanted to experience what it was like to record the ending credit music. He accidentally recorded it...and then recorded the Zyuranger theme song on the same tape. Ehhh not really. That wouldn't explain why it suddenly becomes Total Recall again in the middle of the song. I dig the grandness of the theme song, even though it is a little bit all over the place. It's high-energy, yet not overly peppy like the Jetman theme. It definitely works. Bouken shite rapapiyaa, the ending song, is one that some people love to hate. I happen to be fond of it myself. I don't know, maybe I like that they were trying something completely different. It's a strange exercise in power-clashing. Sentai theme songs, to this point, were largely complementary of each other. There may have been a handful of shows like Sunvulcan and Liveman that did things a bit differently, but they weren't quite the departure that the Zyuranger themes are. Having this song and the end credits suddenly play right when the episode was getting good was the equivalent of waking up just when a dream was getting really good. Or it's trolling. Toei was trolling us...hard...and I love it. Oh yeah, this CD has Karaoke! Yes! 1992 was the beginning of the Karaoke revolution that lives on today. Sure, you can't program these discs to work in your Karaoke machine...but having Karaoke versions of the original song is a far better option than settling for a cheap sound-alike. Karaoke versions of both songs here, so four tracks in total. I should also note that the lyrics are once again printed on a separate sheet of paper from the tanzaku. This sheet of paper was also included with the cassette version of the single. The theme song is certainly one of my favorite of all of the Sentai theme songs. It is a little bit anti-theme song...but it still works perfectly in a fight. It's a 180° (or 360°, if you're a dumbass...yes, I recently got into an argument over which one was correct) of the Jetman theme song. I guess 'urgent' is the word I'm looking for. It isn't too dark, but it definitely plays up the importance of watching this show. The production is stellar...totally on par with the great sound of the Turboranger songs. Oretachi muteki sa!! Dairanger is the name of the ending song. This time around, they kinda went back to the formula of having the ending song sync up with the opening song. This one also made my list of best Sentai ending songs for very good reason. It has all of the pros of the opening song (minus the gong) and manages to be completely suitable as an ending song. I love it. The story is pretty much the same as the Zyuranger single--two vocal, two karaoke and the lyrics are printed on a sheet of paper. I talked about this one some time ago. Basically it's a drama CD that was released as a promotional item with TV-Kun Magazine. I don't have an exact release date, but I assume that it was released around episode 20ish. It's four tracks long and the only real notable thing about it is that the Dairanger cast actually sing on it. Anyway, yeah, I file this one under 8cm CD Singles even though it very much isn't one. Physically it is, but the content doesn't quite line-up. Both theme songs from Kakuranger are on par with the Dairanger theme songs, but don't quite line up. I might consider Kakuranger my absolute favorite Sentai, but Dairanger has the better theme songs. That said, I can totally rock out to either one of these songs. The opening song, Secret Kakuranger by Tou Chi Chen is another anti-theme song of the same ilk as Dairanger's theme. Just like that one, it feels at home in a fight scene despite not outwardly being upbeat. The ending theme, Ninja! Matenrou Kids is bundled well with the opening theme. The one advantange that both of these theme songs have over the Dairanger theme songs is that they both sound absolutely excellent in their instrumental forms (instrumental replacing the vocals, Karaoke just has the vocals omitted). I especially love the instrumental version of Ninja! Matenrou Kids. Neither one of the instrumental versions are included here, however we do get Karaoke versions of both theme songs. Same deal with the lyrics...they're printed on a separate piece of paper. Oh wow! This is the first legit single on this list that doesn't feature the theme songs! How about that? It does feature two of the show's mecha theme songs--Detazo! Kakure Daishogun by Hironobu Kageyama and Muteki Shogun Tadaima Sanjo by Takayuki Miyauchi. Kakure Daishogun really got the first really good mecha theme song of the 1990s...in 1994... OK, maybe that isn't fair. I kinda dig the Fiverobo theme song from Fiveman (also by Kageyama). Speaking of KAGE, I'm not really liking his shaky vocals in this one. What was going on? Still a good song, but I don't think the vocals were all there. I would much rather listen to the BGM for either mecha than their actual songs. The format is the same. Yes to Karaoke, yes to lyrics printed on separate paper. I like bringing up the Ohranger theme songs as much as I can. I previously talked about how there is pretty damning evidence to suggest that the series almost *at least* had a very different ending theme song. Whether rumors behind the changes to both theme songs is true (the somewhat late release date of this CD seems to suggest it is) the songs that we did end up getting as theme songs to Ohranger are both quite good. The opening theme, Ole! Ohranger, and the ending theme, Kinkyu Hasshin! Ohranger are both sung by Kentaro Hayami. Maybe Ole! Ohranger isn't the best theme song...and Niji iro Crystal Sky probably *should* have been the theme song, but it's serviceable. It kinda falls into the repetativeness that I loathed in the Jetman OP, but at least it isn't cheesy. It just fits. I think they ended up with too many songs that sounded like they could have been a theme song and made their selection rock-paper-scissors style. 'Kinkyu Hasshin' is also another great song that works incredibly well as an ending theme song. 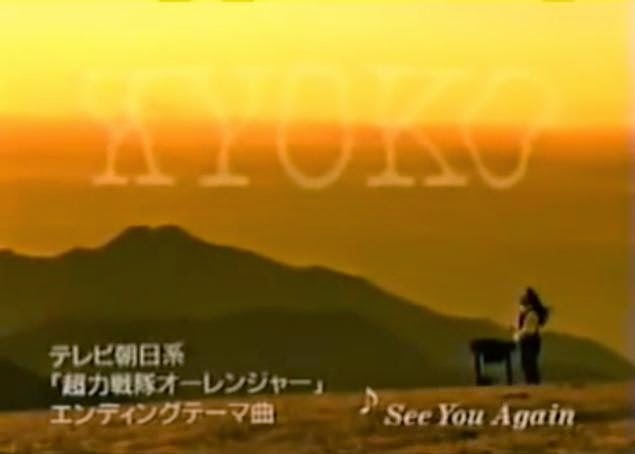 I personally would have enjoyed to hear something completely out of left field like Kyoko Sound Laboratory's See You Again, but at least what we did end up getting was still very good. This single has four tracks--two vocal, two karaoke. The lyrics are printed inside the tanzaku this time. If you haven't already, I recommend checking out my original article on the subject of the abandoned Ohranger theme songs as well as the brief follow-up. I'm kinda bringing this thing full-circle. I began this post is a somewhat retro release covering two different series...and now I'm ending it the same way. This time, I have a for-real retro release. This single covers the theme songs from Himitsu Sentai Goranger and JAKQ Dengekitai. The Goranger songs, Susume! Goranger (OP) & Himitsu Sentai Goranger (ED1), and JAKQ songs, JAKQ Dengekitai (OP) & Itsuka, hana wa sakudaro (ED) are all by Isao Sasaki (with Mitsuko Horie on the Goranger OP). Both Goranger themes are classics. I'm sure you've heard them both at some point or another. If only there was a way to be able to hear those songs with a fresh set of ears. Anyway, I like both of the Goranger theme songs included on this disc, but my favorite theme has always been the second ending, Miyo! Goranger. It's a shame they didn't include it. It would have easily fit in with the 24 minute time limit on the disc. Both JAKQ theme songs are also excellent. They're both pretty subtle affairs, which make them somewhat unique among the early Sentai theme songs. The only real pulse the opening theme song has is the crazy guitar work. It's just the four vocal tracks on this disc. Surely they could have fit more, but I guess we'd be getting into album territory. The lyrics are printed on a sheet of paper once more. Recommended Pick: Dairanger Shudaika...hands down winner. Two great theme songs, two great Karaoke versions of the theme songs that truly enhance the experience of the songs. There is some really cool artwork, and it's from an awesome series. This one wins all around! This is one of those rare situations where you don't have to wait for the next part. As I mentioned earlier, I took a look at all fourteen of the Carranger CD Singles back in January. I'll be back soon enough with the remaining parts in this series on Sentai CD Singles. As always, be sure to check out my CD Collection page for more articles and an incomplete list of all the stuff I have. I try to add stuff as I get it, but...yeah, that would almost mean daily updates a lot of the time...and who has time for that? I think I’ve mentioned before that 80’s and 90’s (particularly ‘85~’99) were “Golden Ages” of Toei tokusatsu shows, especially for Sentai, where there were so many great and memorable shows; even the weaker show has some redeeming qualities, compared to recent years. The music is no exception, where I found most of them to be very memorable and tends to listen to frequently (especially for Metal Hero; Miyauchi was especially awesome!). I really like Liveman and I also like OP/ED as well. It’s the first time that actor gets to sing both OP and ED, which I find it fascinating. Daisuke Shima did such a great job. The OP has very nice “explosive” sound which makes it awesome! Looking forward for Jiraiya songs. While I may not be a big Turboranger fan, I REALLY liked the songs. It’s still hard to believe there was time when actor (Red Ranger) sang OP/ED, 2-years in the row! To this day, it’s hard to choose which series has better song. On one hand Daisuke is better singer and has more experience, on the other hand Kenta is very energetic and catchy. If I had to choose, Liveman has better OP, while Turboranger has better ED. I still wish there was Turboranger vs. Liveman back then. Just imagine the duet of awesomeness! Not too much to say on Fiveman, which is pretty average (which sums up the show). I don’t hate it or love it… it’s alright. Didn’t know about Tom Sawyer song… interesting. Average sentai, average song. Next. As much I love Jetman (I admit that it is overrated), the OP is very outdated. There was a time I liked the OP, but as I listen to it more, it just doesn’t age very well. It’s very weak when you compare it to Changeman and Maskman. I wasn’t aware about MMPR inspiration of it; interestingly, Saban wanted to adapt Jetman for PR instead of Zyuranger. On contrary, I really like the ED, which matched the atmosphere of the show perfectly. On the Jetman/MMPR theme connection. There seems to be mixed feelings behind that. It's strange that it even came up at all in an interview with a toy mag (the issue *was* PR Toy-themed, but still kinda weird that the little story about the theme song came up). I might be missing something, but I'm fairly certain that Suzuki was either speculating or embellishing the truth. The Power Rangers theme is as garbagey as any other 80s/90s American Kid's show that was given a 48hr deadline to complete. I'd like to think there is some truth to it. It'd be kinda funny. I found Zyuranger to be oddball and beginning of the new era of franchise. First fantasy motif, emphasis on kid, colorful suits, and tons of mecha! The fact that OP/ED sang by different singer is one of indication. I like OP, even though it takes a while til we hear lyric; nevertheless it is nice song. Speaking of Kenta, Shougo B’Stard blog entry “Toku Heroes Who Could Have Been” stated that he was an original choice for Burai. While I do like Kenta, it’s hard to imagine him playing evil and tragic character, more than Izumi. ED song on other hand was very weird and awkward when I first listened to it. It matches the atmosphere of the show very well, but it’s really campy and cheesy, that it’s not something I listen to it over-and-over. It’s not the worst ED ever made though. I’m not huge fan of it. What can I say about Dairanger OP/ED that hasn’t said before for 9,000 times by everyone? It’s epic, energetic, and pure awesomeness! Hands down the best OP/ED of 90’s sentai and belong on Top 3 overall best OP/ED song. Kakuranger had very unique and strange OP/ED. OP was mellow, which is somewhat interesting for OP, but it somehow matches the atmosphere very well. The lyric was pretty unique as well. I really love the ED, where Dorodoros dancing is very cute and hilarious. Tou Chi Chen (not the real name) is such an underrated toku singer and wished they had more toku songs. Speaking of mecha song, I agree that Kakure Daishogun is better song, where Kageyama was still top of the game. Muteki Shogun on other hand is lackluster in comparison. It deserves a better song. One of Miyauchi weakest song IMO; it’s not as bad as later one, such as ToQ-Oh. While Ohranger may not be my all-time favorite sentai (I think it’s alright) the OP/ED is one of the stronger aspects of the show. Kentaro Hayami did pretty good job. Since Ohranger had so many varieties of songs (including Kyoko abandoned song) it would have been interesting if OP/ED changed between 1st and 2nd half. Ole! Ohranger / Kinkyu Hasshin for 1~24 and Niji iro Crystal Sky / See You Again for 25~48. Nice to put Goranger and JAKQ at the end for bonus. Interesting that Big One is absent on cover; then again, he did showed up late (23) in the series, but still he is practically face of the show. Looking forward to see remaining Sentai CD Singles!